I suppose every Filipino knows this tasty pork stew recipe that is afritada. It's an easy home-cooking recipe really. If I can do this dish, so can you. Read on to get my easy pork afritada recipe. Cooking afritada shows how much influence the Spaniards had on Philippine cuisine. 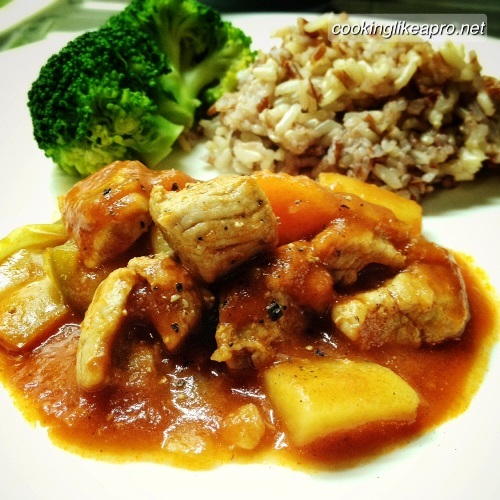 Afritadang baboy (pork) or manok (chicken) is a simple saute'-stew recipe that is tomato-based. Being so, it's yummy for both children and adults. It's not pork caldereta, by the way. Although, there are some similarities. Afritadang baboy is very easy to cook, really. Its ingredients are not hard to find, either. All you need is the complete list of the needed ingredients which I am sharing with you right now. 1. 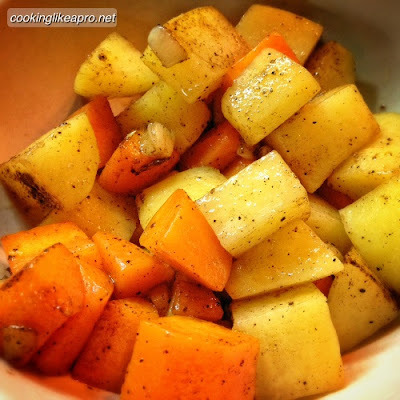 Fry the carrots and potatoes first in a very hot pan. 2. Set aside in a dry bowl once cooked. Season with fish sauce and pepper as it sits. 3. Saute' garlic in the same pan. 4. Fry the pork when the garlic turns golden. 5. Add the onions when the pork is cooked or changed its color. 6. Season the dish with a bit of fish sauce to taste. 7. Let it sit under low-medium heat. 8. When the onions are cooked, add in the season carrots and potatoes. 9. Add hot water, tomato sauce and the bell peppers. 10. Let it boil under low heat. Add water when necessary. 12. Season the dish with fish sauce, pepper and sugar, as desired. 13. Serve with hot rice. Thanks for these recipe. I need to see that I bookmarked this page and suggest it to kuya bill. he loves to cook and afritada seems one of my favorites. Yum! Ginagawa din namin sa chicken yan! I like the tomato-based taste as it combines with port in a pork afritada. hmm... really very simple... :) forgive me but help, i would jut like to know to ask how is this different from menudo? maybe some additional ingredients here and there? looks yummy! afritada is a dish that even a no-good cook like me can do. I like your version of this dish, so simple and easy. An easy recipe that the family will enjoy to eat. Afritada is one of the old-time favorites of Filipino families and my family for one like it very much. Hope to try this recipe later. This is very easy recipe. Added with tomato paste is a sure WIN! Taste yummy. One important tip that I got from my Mom is to chop the ingredients like the vegies in such a way that everything is coordinated like you did here. Cubes for the hard ones like potato and carrots, square shapes for the rest. So that the end product or the cooked dish will look much more appealing. thanks for sharing the recipe. i actually make a mean chicken and pork afritada pero tansta tantsa lang kaya i couldn't share the recipe. Nice photos of the ingredients. A lot of food/cooking blogs forget how important pictures are to the mix. On the recipe itself, I can't practice it as I don't really cook at my place :( What a shame. This is one way to encourage kids to eat vegetables together with their meat. In my opinion, kids like a lot of dishes with tomato sauce in it. Do you have the same observation?